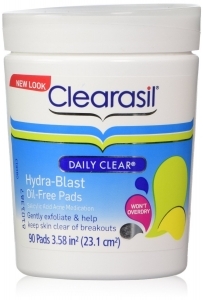 Clearasil® Daily Clear® Daily Pore Cleansing Pads are dermatologist tested and helps keep skin clear of breakouts. Exfoliating action helps lift away dead skin cells to help keep pores unblocked. These pore cleanser pads are scientifically formulated to wipe away dirt, oil and bacteria. So you get visibly clearer skin every day.